I'm just wrapping up the first full week of a three-week unit on Native Americans, and this seems like a great time to credit a writer whom I use in my class, and whose text came along at a time when I was going through a fundamental change in my teaching--just when I needed it most. 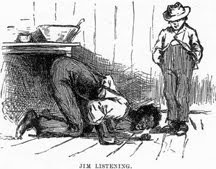 I was about 10 years into my teaching career before I taught 11th-grade English, which in most schools doubles as a survey course on American Literature. Originally, I set up the course in my block schedule as a series of one-week units--Western Week, Whaling Week, Romantic Week, etc. With this schedule, moving sequentially through the textbook, I often made it to World War II before petering out. It was disappointing, too, because the literature moved so quickly, there wasn't time to get deep into writers, much less to write or research about them. Common Core came along at a time when my teaching needed a boost, and it was a big help to me. One of the most significant changes it brought was the requirement that English classrooms teach more informational text. There was a lot of angst among teachers that we would be giving up our Scarlett Letters and Grapes of Wrath for...what exactly? I decided to make my Native American unit a focus for developing Common Core lessons of my own. The unit had long been a benchmark for me in trying to adapt creative, outside ideas into my teaching. For example, in partnership with TPAC Education, I had developed some lessons that incorporated dance into a study of Native American myths way back in 2010. I hoped that informational text would enhance my students engagement with my country's native heritage. 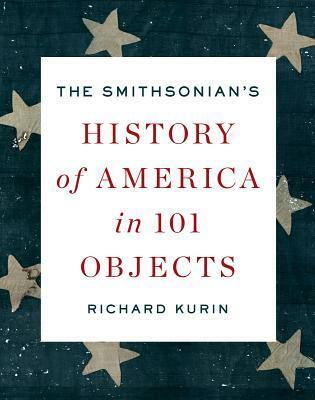 At this time, I found Richard Kurin's book, The Smithsonian's History of America in 101 Objects in my local library. The 101 articles in the book cover the sweep of American history from prehistory to the present day. I have long been a history buff, and many of his selections--George Washington's uniform, Thomas Edison's light bulb, a baseball signed by Babe Ruth--were obvious selections. 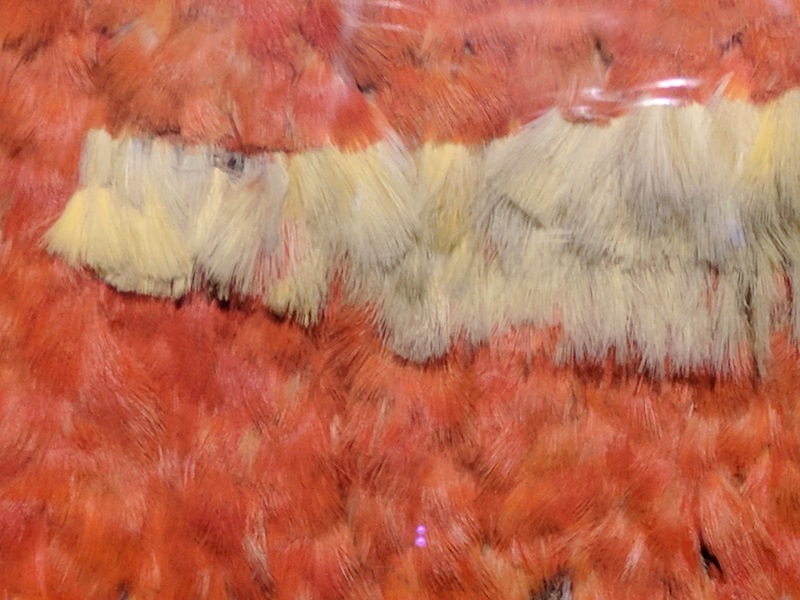 But when I looked for Native American artifacts in the collection, one caught my eye immediately: King Kamehameha III's Feathered Cape. It wasn't the only Native American artifact--there are four pre-Columbian inclusions, as well as Sitting Bull's drawing book and a portrait of Pocohantas. But it fit in with a group project I had developed, encouraging research and analysis through an examination of Native American artifacts. King Kamehameha III was a native Hawaiian king who ruled in the 1820s, a time of modernization and Americanization in Hawaii. At this time, native Hawaiians still controlled the islands and maintained traditions that had lasted centuries. Kurin's essay describes an astonishingly beautiful yellow cape, made of feathers plucked from living birds and hand woven. Sadly, Kurin also describes how Hawaii was gradually overwhelmed and annexed into the United States, the final link in a chain of Manifest Destiny that had begun with my home state of Tennessee just a decade after the end of the Revolutionary War. I selected Kurin's essay, "King Kamehameha III's Feathered Cape," and after four years of tinkering, I'm really glad that I did. I'll try to describe the essay and the unit here, focusing on the way I planned the unit and adapted the Common Core standards to do so. I copied Kurin's essay by hand into a Microsoft Word document so I could number the lines and make the essay available to students to annotate. I had to edit the essay down by a mere 60 words or so to fit the front and back of the page. It came out to around 90 lines of text. This is the first informational text that students read in my English 11 Honors class, and I want to teach them how to annotate for main idea. It will lead to our first essay of the year, too, so I want them to identify and grasp the details through which Kurin describes his artifact and its history. At the end of the reading, I ask students to share with a partner where they found Kurin's main ideas. Then we move into an accountable talk discussion. This year students honed in on Kurin's description of Americans' influence in Hawaii, particularly in this sentence, "To their way of thinking, the Hawaiians were heathens who needed to be converted to Christianity and civilized" (24-25). They are engaged with the text. Many think that Americans were wrong to inject their language, religion and culture into Hawaii--others defend the practices (many of my students have been on mission trips to other countries). One year someone brought up "head hunters." Using only the text, we look at why King Kamehameha III gave the cape to Captain William Finch (31). What does this symbolize? What did Finch do to gain such a valuable prize? This is such a fun discussion to watch. This is the moment every year that I realize how packed with details Kurin's essay really is. I see the article generating critical thinking in students--they're questioning Manifest Destiny, weighing their own culture in the view of another that is older and unique. 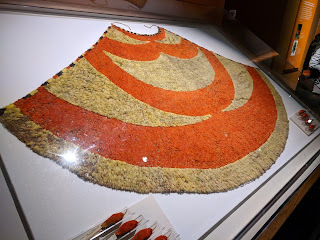 At the end of the discussion, I try to bring out Kurin's underlying point--if students haven't reached it already (about one in four classes to): the feathered cape, given by a Hawaiian king to an American officer, represents how indigenous Hawaiian culture was given up for American culture. At the end of day 1, I ask students to write a paragraph: "Why do you think this feathered cape is significant?" It's early in the year. I'm teaching students how to mix evidence with analysis. Here are some sample responses. These are excerpts from our first writing lesson after I have introduced the need to support thesis statements with quotes from the original text, and connect those quotes to their theses using analysis. I'd say those examples are pretty good! I start off day two with an "ACT-style Vocabulary Assignment" (our first of the year in this regard, too). I have taken challenging words from Kurin's essay and presented them in multiple-choice format, so that students can use (1) context clues, (2) root words, and (3) their own prior knowledge in finding the meaning (Reading Informational Text, Standard 4). I'm using Google Forms' new tool that allows students to see their grade instantly, so they can go over what they've missed. I also project the summary of responses so I can model proper ways to break down a sentence or a word to find the meaning. Next we go back to Kurin's text. I want to focus on organization now (Reading Informational Text, Standards 2 and 5). I show students how Kurin has written a short introduction. I have them draw a bracket from lines 1-3 and write, "Intro." I note the break before line 4, then I ask, "What does Kurin seem to focus upon now?" It's Hawaiian history. Students catch on quickly. I direct them to re-read the text and mark the place where Kurin moves from Hawaiian history to another topic. I ask them to break the essay down to between 4 and 7 general sections (this is to keep them from just trying to label every paragraph--to think on a broader scale). When they are done reading and labeling the sections, they compare notes with another student. Erasers are out, edits are made. By working together, students are thinking in ways they wouldn't under my direction. It's this inherent teen need to explain oneself to another--and to fit in. By the time we come together to discuss the text, it has been thoroughly analyzed. By now, everyone understands (on their own) that Kurin has taken a break from Hawaiian history to describe the feathered cape in lines 37-60. Why did he describe it here? I ask. Some students feel it should be moved to the beginning of the essay. This is good. I want them to see writing as flexible, intentional--not set in stone. This year I pointed out the transition between lines 36 and 37, when Kurin moves from history to description. "This feathered cape" in line 36 directs the reader from a broad look at Hawaiian history to a specific artifact. He has placed the description of the cape following its transfer from Hawaiians to Americans. At the beginning of the new paragraph, he writes, "That was an extraordinary gesture...."
A little bit of "this"--a little bit of "that"! We move on. Students are doing their own research of a Native American artifact. Kurin's essay is a splendid model. In the final sentence of his essay, “King Kamehameha III’s Feather Cape,” Kurin writes, “This magnificent cape serves as a haunting reminder of what was lost” (90). This is a beautiful sentence, particularly because of two words Kurin uses--”magnificent” and “haunting.” Choose one of these words. In 300-400 words, discuss whether Kurin sufficiently supports these words in the rest of the essay...or not. This year was the first year I assigned a specific length in many years, but I'm glad I did. It made grading easier--few were too long or too short. It also gave students one more reason to revise before they submitted their work. This is a lesson I've been working on for four years now. I'm proud of the learning that's possible, and thankful to Richard Kurin for crafting such a remarkable essay that fit seamlessly into my unit on Native America. I continue from this text to read "The Earth on Turtle's Back" the next week, developing reading standards in fiction. I close with Oren Lyons' testimony before Congress (1987) that draws connections between Native American culture and the U.S. Constitution, among other things. I hope this blog demonstrates what a significant change came with Common Core State Standards into my teaching. I seldom taught with informational text before Common Core. My unit on Native Americans was built around the myths--with some cool activities thrown in--nothing more. Now informational text anchors my teaching and--more importantly--drives writing and critical thinking in my classroom. 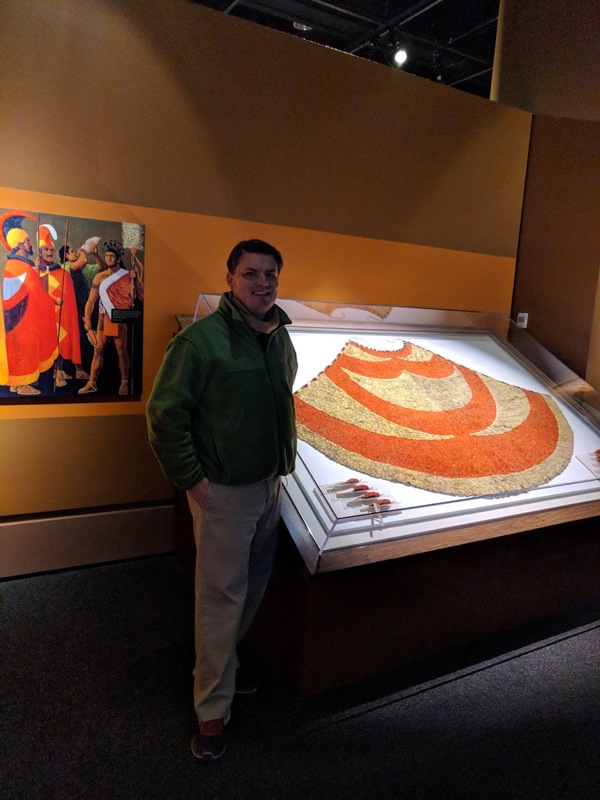 The year after I began teaching "King Kamehameha III's Feathered Cape," I got to visit Washington, DC, not once but twice. (This was after I had read the book and returned it to the library.) The Smithsonian's National Museum of the American Indian had been completed in the years since I had last been to DC, and I visited it each time--partially to sate my fascination with native cultures, and partially because I assumed that Kamehameha's cape could be found there. I never found it. I also visited the National Gallery of Art, the Museum of American History, and the Museum of American Art. There was no sign of the cape. Last year, I bought Kurin's book to keep in my library, and I looked up the cape. Where could it be? It had been in the Museum of Natural History all along! My fascination with Kurin's piece led me to read Stephen Shender's new book, Once there was Fire: A Novel of Old Hawaii. The book, set about 40 years before the regent in Kurin's article, describes the rise of Kamehameha (I) the Great, who used newfound British technology and weaponry to unite the Hawaiian Islands under his rule. Needless to say, I marked every place I spotted a feathered cape and rued every precious artifact that Shender showed being given away to a visiting European exploiter--er, explorer! Here's me next to the cape. The cape in all its glory. 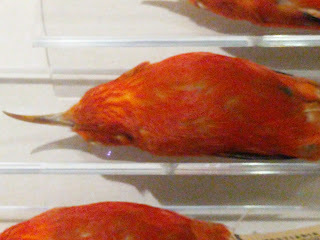 Preserved O'o birds can be seen in the lower corners. Detail of the O'o birds on display.